Kuoni’s Global Travel Distribution arm, GTA announced Thailand as its first new Strategic Partnership Program (SPP) destination for 2016. Together with 64 premium hotels across six locations in Thailand – Bangkok, Phuket, Koh Samui, Chiang Rai, Hua Hin and Pattaya, GTA will take the lead to promote the many luxury experiences available in Amazing Thailand; in line with Tourism Authority of Thailand’s new focus for 2016. The first SPP that promotes 6 different locations in one country. 75% are 5-star hotels and the rest are 4-star hotels. 10x g shop reward points for travel agencies and wholesalers to kick start and promote partner hotels. Thailand is a key destination in Asia for GTA, constantly ranked among the top 3 in the last 3 years. Last year, GTA achieved an outstanding room-nights growth of +32% Year-on-Year and over +47% Year-on-Year in Sales Revenue to destination Thailand. 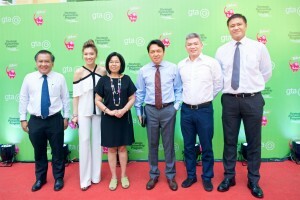 With the introduction of this Strategic Partnership Program, GTA expects to deliver a higher Average Daily Rate (ADR) for destination Thailand and will focus on delivering longer stays from upscale travellers to the key locations in Thailand. Niti Vongvichasvadi, Chief, Marketing Action Plan Section, ASEAN, South Asia and South Market Division, Tourism Authority of Thailand. Cyndi Ng, Head of Market Development and Strategic Partnerships, GTA. Runjuan Tongrut, Executive Director, East Asia Region, Tourism Authority of Thailand. Tanes Petsuwan, Executive Director, Europe, Africa, and Middle East Region, Tourism Authority of Thailand. Daryl Lee, Regional Vice President of Sales and Marketing, Asia Pacific, Middle East and Africa, GTA. Kittipong Prapattong, Director ASEAN, South Asia & South Pacific Market Division, Tourism Authority of Thailand. We are very proud of GTA for taking the lead to bring together 64 premium hotels and promote the destination. Also, more importantly is having Tourism Authority of Thailand support the program as all our objectives are greatly aligned,” said Ms. Samornpun Somnam, Executive Director of Keemala at the launch event. Thailand drew 29.9 million international visitors in 2015, an increase of more than 20 per cent compared with 2014.